Can't send GIF on WhatsApp? Here's how to send animated GIF on WhatsApp Android iOS iPhone or Web. Convert video to GIF on WhatsApp Web. When it comes to interesting pictures, animated gif is probably the best idea to express how you feel, to show a funny moment, to show your love or to simply humor your friends. Here’s how to send gif on WhatsApp iPhone, iOS, Android and Web. Graphic interchange format, or mostly known as GIF, is a type of image format containing short animated picture without sound. Typically used on websites and social messaging apps such as Facebook to describe and deliver a reaction or to make a point. GIF is the only image format that can store and display animated images. Unlike many other social messaging apps which already have the ability to allow users to send gif, this feature comes in late in WhatsApp. Well, it all started when I started seeing gif pictures flooded in my WhatsApp group chats. It was a feature released not long ago by WhatsApp, for people to send and share animated gif through WhatsApp from their smartphones. While it’s not as easy as it seems, we will make sure the guide is simple enough for you to understand. Since both iOS and Android doesn’t support native gif images, you can’t just simply save a gif image and send it in WhatsApp. It won’t work and will only turn out to be a static picture. There are basically 3 ways to send or share a gif image to a conversation in WhatsApp. Share from a gif source website such as giphy.com on a browser. Send or forward an existing gif image previously sent by your friends. 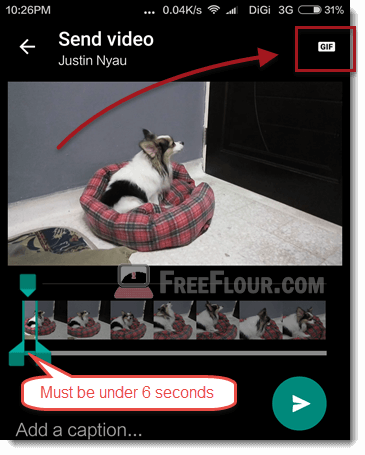 Record a video or send a video as gif image. Update: Install a gif keyboard or app on your Android or iPhone. Save and send the gif image from the app to WhatsApp. First method is only applicable to iOS users. If you are using an iPhone, to share a gif image you found from Safari, simply tap and hold the gif picture until menu shows up. Select Share and then select WhatsApp. Choose the group or individual chat you wish to send the gif to. If share doesn’t appear as an option, select Copy then paste it into your WhatsApp conversation. It’ll do just fine. 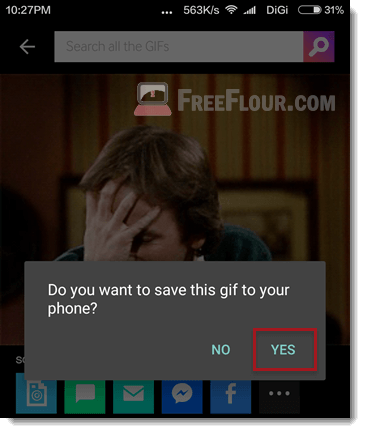 For Android user, unfortunately, there is no way to send a gif you found from your browser. The closest possible way is to copy the image link and paste it into the conversation but it will only appear as a link, not as an image. Use other method instead. Second, third and forth methods are applicable to both Android and iOS iPhone users. Detailed guide will be listed below. By “existing” I mean the gif image had to be sent by one of your friends to you or to your group previously. It would be saved onto your phone’s drive as a WhatsApp cache. This means that you can directly forward the gif image from within WhatsApp to anyone you like easily. Here’s how. Assuming somebody sent you an interesting gif image and you want to forward and share this to other friends. In WhatsApp, go to the conversation who you would like the animated gif picture to be sent to. Click on the attachment button > photo / video or Gallery (just like how you usually upload a photo or image). There will be a new tab called GIF which will show you all the gif images currently available on your Android or iPhone. Click on it and select whichever gif you want to send. In WhatsApp, you can crop and convert an existing videos into animated gif images that can be sent to your friends. But, it’s limited to only 6 seconds of the video. In WhatsApp, go to any conversation you wish to send the gif to. Click on attachment, then Gallery. Select any video you want to convert and send. Drag the bar below to crop any part of your video but limit them to under 6 seconds. This is very important because if it isn’t under 6 seconds, the convert button won’t appear. Click on the video recording icon at top right corner of the screen. When it turns to GIF, you can proceed sending it. It will then show up as a gif image when sent. As for recording a fresh new video, just record a video with your phone’s camera app, save it and repeat from step 1 above. This is probably the best way to send a GIF on WhatsApp from your devices. A GIF keyboard or app such as Giphy app, iGIF or Gboard consist of an uncountable amount of gif images finely categorized and ready to be used. As there are too many gif apps out there on the market, we will only show you an example of using Giphy app. For iOS users, we recommend iGIF. If you prefer other app, we would suggest you to just use any of them that comes free. It doesn’t worth your money to get something already provided by many other developers free of charge. Here’s how. Download and install GIPHY app from Google Play or AppStore. Browse through the collection and select the gif you want to send. Tap and hold on it til options appear. Select yes to save it onto your phone. Go to WhatsApp and to the conversation where you want to send the gif to. Click on the attachment icon > Gallery > GIF. Select the gif you have saved earlier and send it. Unfortunately, the gif feature is not fully implemented in WhatsApp Web yet. However, you can view gif images on WhatsApp Web when your friends send them to you, but you won’t be able to send them to anyone on WhatsApp Web. You can also try all the methods above to see if it will work for you on WhatsApp Web. In most cases, you will be receiving an error message saying that file you tried adding is not supported.